A woman travels from Maine to Massachusetts because she was ordered by her voice, a spirit called “Crystal,” to make the trip. A man delivers insects to his neighbors’ homes to minimize the effects of poisonous toxins that he says exist in their homes. Lynn Nanos accurately describes the daily struggles that an emergency clinician confronts on the job. Breakdown hits on all the hot-button issues and challenges of today’s crisis team environment, such as the proliferation of substance abuse in our society, the proper use of Section 12s and balancing the liberty rights of the individual with the protection of the community at large, managing the pressures of hospital emergency rooms faced with the daunting challenges of inadequate bed availability and the revolving door of psychiatric admissions due to shortened length of psychiatric hospital stays, and the ongoing process of forming appropriate and collegial relationships with police departments, group homes, and assorted State agencies, such as DMH. Nanos expertly examines some of the inherent and structural obstacles that confront an emergency clinician on her or his shifts. She further opines on some of the more controversial issues of the day, including outpatient commitment, but does so with the compassion and insight of a professional who has worked in the trenches of the field. I highly recommend Breakdown for anyone interested in the realities of emergency services work and how such work affects the community. Lynn Nanos has put together a precise compilation of factual information for anyone disturbed about how seriously flawed our mental health care system is today. This book brings to the forefront the steps that must be taken in order to help our most vulnerable members of society, the mentally ill. Nanos irrefutably hits the target in advocating for Assisted Outpatient Treatment. For anyone concerned, particularly those who work in the field helping those with mental health issues, Breakdown is a must-read. Breakdown is an excellent synopsis of the plight of the mentally ill in the United States. It brings to the forefront the need for immediate change in the way treatment and services are afforded. As a career law enforcement officer, I applaud the author of Breakdown for her insight and dedication in promoting future positive changes with regard to treating mental illness. 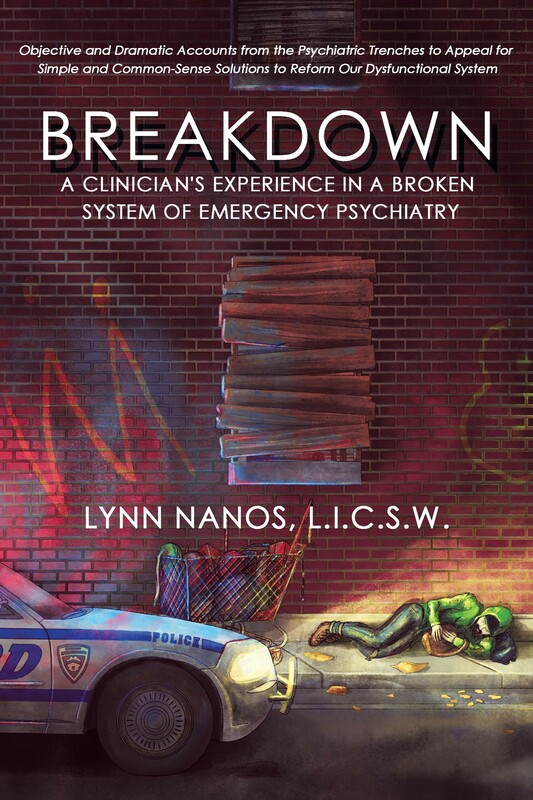 Lynn Nanos guides readers in Breakdown: A Clinician’s Experience in a Broken System of Emergency Psychiatry through our nation’s shameful treatment of Americans with debilitating mental illnesses. Only someone with her in-the-trenches experience can articulate the flaws with such authority. Her dedication to helping throw-away patients trapped on a treadmill of hospitalizations, homelessness, and jails is heroic and inspiring. Lynn Nanos, L.I.C.S.W., manages to capture the devastating consequences of untreated serious mental illness that families witness daily, using vignettes to document her interactions with her patients. Breakdown: A Clinician’s Experience in a Broken System of Emergency Psychiatry is a well-researched look at the many problems that have plagued our broken mental health system for decades and offers evidence-based, practical solutions. This book is a must-read for anyone with the power to fix our broken system. As a mother who has witnessed first-hand the horrible suffering inflicted by a society which has abandoned its seriously mentally ill, I am so grateful to Lynn for having the strength and courage to write this book. We have been struggling to find effective and humane means for the care of the seriously mentally ill at least since the time of the Industrial Revolution. Despite this long history, the contemporary “system” of care in the United States is arguably worse than many of its predecessors, due to its fragmentation, disorganization, financial mismanagement, and inability to rise above polarized policy debates that are not backed by evidence. Lynn Nanos draws on her significant clinical experience and her deep knowledge of legal and policy backgrounds to give a moving first-hand account of the people who suffer in the current “system.” She also provides practical and realistic proposals for how we might begin to make repairs. Author Lynn Nanos provides a gritty and extremely candid look at our dysfunctional mental health care system. Her extensive experience in this trying environment provides a view of that world that few ever see. If you’ve ever wondered “Why don’t we do more for the mentally ill?”, read this book and you’ll understand. Ms. Nanos speaks about the broken system that is supposed to treat devastating psychiatric illness from experience after working in the trenches for many years. It is concerned clinicians like her who are the only hope for finding solutions to this current mess of a treatment system. Author Lynn Nanos offers a much-needed description of the problems with our current mental health system through the eyes of her experience as a clinical social worker. Her compassion for the unmet needs of the patients shines through, as does her concerns for where the system is failing. She shows how that flawed system for those with severe mental illness makes it the most difficult for those who have the most difficulty. If anyone wonders why our jails, emergency rooms, and homeless shelters are overwhelmed with persons with mental illness, they would do well to read this book. It will open their eyes. In Breakdown, Lynn Nanos draws upon years of clinical experience to expose one of our society’s most shameful injustices: the neglect of individuals with serious mental illness. By weaving together her own first-person account with historical, political, and legal background, Nanos issues a clarion call for the construction of adequate mental health services for our most vulnerable citizens. Lynn Nanos’ book Breakdown is a welcome addition to those that seek to educate the public about America’s mental health crisis—one that too many willfully neglect. And she offers a valuable perspective from the front lines of a broken treatment system, where psychiatrists and social workers are overwhelmed by people for whom fewer and fewer inpatient treatment beds are available. Many do not even know they are sick and, after being released to the streets, will wind up behind bars. Nanos sees clearly the consequences of failing to treat the most severely ill among us, and she understands why systemic reform is so badly needed, particularly in her state of Massachusetts—one of just three states without an Assisted Outpatient Treatment program—where there is little to prevent the most severely ill from cycling through our emergency rooms, homeless shelters, and jails. “One tragedy should be enough to sound alarms,” Nanos writes. Indeed. Yet, human tragedies continue to befall people with serious mental illness and their families at a record clip. I can only hope that this book will open eyes, ears, and hearts to their suffering, motivating action. Breakdown: A Clinician’s Experience in a Broken System of Emergency Psychiatry is yet another excellent example of our badly broken mental illness treatment system. The author, Lynn Nanos, is a psychiatric social worker within the Massachusetts state system, which is one of the worst states. She clearly describes the failures of the system and consequent tragedies for the patients. I recommend her well-written book. If there is a right to be sick, there is also a right to be rescued. This book hits the right balance in that delicate equation, written by someone in the trenches and on the front line with seriously mentally ill persons day after day. The book underscores forcefully that it is not the mental health system that is broken and in a “mess.” Rather, it is the mental illness system that requires rescue from economic, political, and cross purposes polemic bickering. Meanwhile, families and an entire public continue to watch as seriously mentally ill persons continue to die, languish in prisons, or suffer on the street with their rights on. Lynn Nanos is a present-day Dorothea Dix pointing out the tragic obvious, and suggesting attainable, evidence-based, affordable remedies. Lawmakers, policymakers, and others who are responsible for shaping national, state, and local systems of care and treatment of serious mental illnesses too often have no practical knowledge of the individuals who suffer the most devastating consequences of psychosis or mania. In Breakdown, Lynn Nanos educates us with real clinical vignettes that give voice to individuals whose illnesses prevent them from accepting medical treatment that can save their lives. This book provides a window into a world that most people will never see, making it a must-read for anyone who is interested in understanding and reversing the country’s decades of neglect of our most seriously mentally ill citizens.